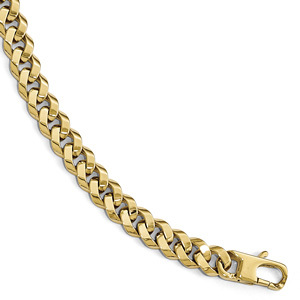 Our 12mm wide 14k solid yellow gold handmade curb link bracelet is a high quality, substantial men's bracelet that can be passed on through many generations, with proper care. Handmade link bracelets are far superior to standard machine-made links, as individual craftsman spend time giving attention to every detail of the bracelet for a high-polished and clean surface free of the typical imperfections of machine-made bracelets. Actual measurements are 12.3mm wide x 2.8mm thick. The bracelet weighs approx. 54.4 grams in 8 1/2" length (we recommend 8.5" for a standard man's average wrist size due to the size of the links. The bracelet is also available in larger custom sizes, from 9" - 10" or any custom length by request. Gram weight will increase for larger sizes. This bracelet is handmade to order in the U.S.A.! Please allow 3 to 3.5 weeks before shipping. Also available in any metal by request, including 10k, 18k, or 22k gold. Also can be made in white gold or rose gold by request. We guarantee our 12mm Handmade Curb Link Bracelet, 14K Solid Gold to be high quality, authentic jewelry, as described above.